Marghe came up from her not-dream. She felt stiff from standing still so long, and her pattern singers were gone, except for Thenike. Marghe smiled at her, but said nothing; she did not want to talk yet. In silence, Thenike helped her walk through the evening shadow of the trees until her joints unstiffened. Undergrowth rustled beneath their feet. Marghe felt she had been gone a long time. Much longer than the two or three hours it had taken for the world to turn away from the sun and towards the arms of evening. She had been inside herself in a way she had never thought possible; listening to her body as a whole, a magnificent, healthy whole. And she had done more: reliving memories of her childhood she had forgotten, experiencing again days she had never been wholly aware of. Now she knew how it felt to be a baby just ten days old, and that baby had been as alien to her as any species she had encountered since. There had been more: what felt like days of communication between herself now, and herself of many thens. She had sent a question down all the avenues that opened before her: what is my name? And echoing back had come: Marghe. And again: Marghe. And then, whispered in a voice she knew: Marghe, and more. She was on a thin and misty beach; her mother walked from the shadows and held out her hand. 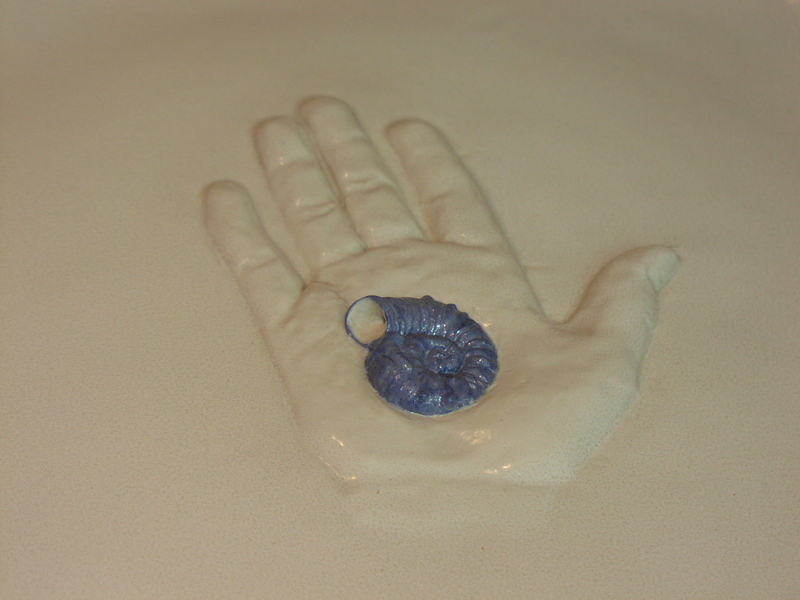 On her palm was the ammonite. Her mother had faded, leaving the ammonite. Marghe had not been surprised when it sank into her hand. And now she was herself, and more. The complete one. Two more chia birds called back and forth. The same ones? Marghe stopped and tilted her head to listen. “Do many women keep their child names?” she asked. Now I’m simply determined. One day, I’m going to find a chocolatier who will make me some chocolate ammonites. Big ones and little ones. Bet on it. 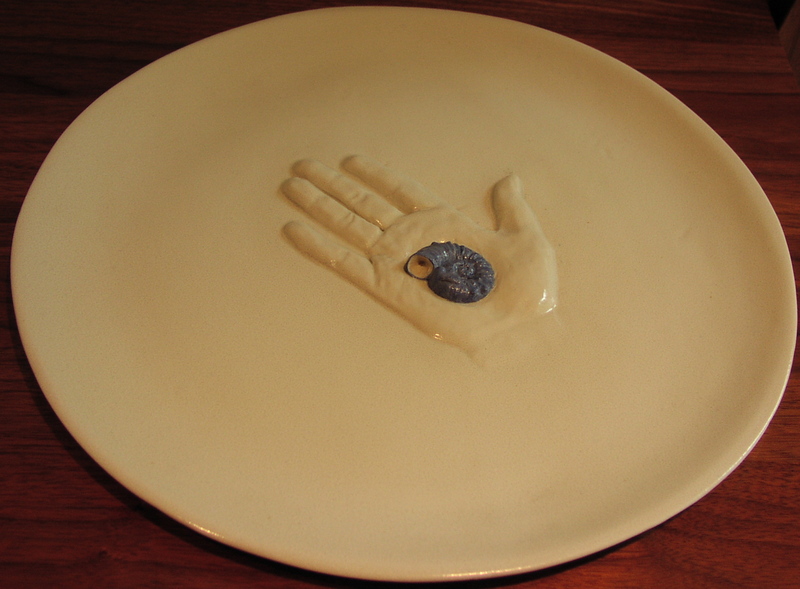 Meanwhile, I’ll have to figure out a way of displaying this plate safely. I had no idea I’d been missing it but now that’s it’s back, I want to keep my eye on it. It feels like some kind of harbinger. Life is strange but good. Wow. Cool award! And who picked that passage? Great selection. jennifer, I'm guessing the sculptor read the book and chose the image. I picked the passage today to match the photo. Thank you for posting this; I'm glad a wider audience will see it. It's a unique and lovely award. I appreciate you sharing it with us, along with the quote. Yours is a wonderful gift and I'm glad I've had the opportunity of enjoying it. I wasn't surprised to win. Not that I expected it, but I just wasn't surprised. I felt as though something were just snicking into place. It felt very, very good. wordsofbarrett, my pleasure, always. And thank you. Lovely award! It makes me go all misty eyed. I'm sorry, I laughed about your being ready and not getting that chocolate typewriter. In my defense, it was kind laughter. I hope you find that chocolatier soon and please take photos. Thanks. That is pretty fantastic, as is the lil' chocolate ammonites idea. As they say on Internet: pics or it didn't happen! What a beautiful award. To win, first, but then to get that! Wow. And well deserved.